News of a Child's Play reboot broke last week, but Chucky remains one of the most iconic modern horror villains. 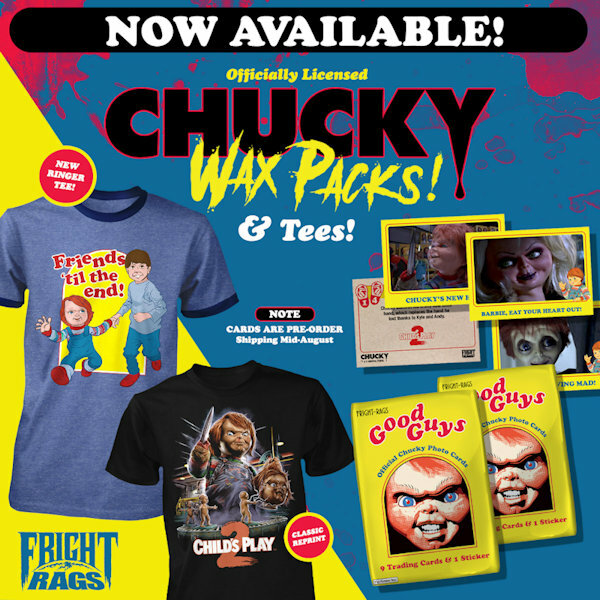 Fright-Rags embraces the legacy with a new collection of Chucky merchandise. 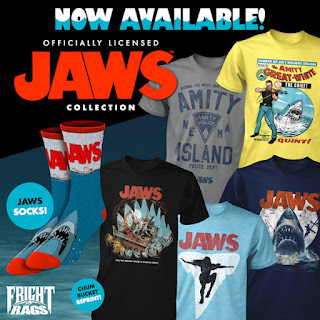 The company also rings in the summer with fresh Jaws apparel. Available in single wax packs, factory boxes, and seal boxes, Fright-Rags' Chucky trading cards include movie photo cards, stickers, art parallel cards, rainbow foil cards, and one-of-a-kind sketch cards. They span the franchise, featuring everyone from Chucky and Andy to Tiffany and Glen/Glenda. Fright-Rags' Chucky collection also includes a "Friends 'Til the End" design (previously available as a kids shirt) on adult ringer tees and a reprint of Justin Osbourn's fan-favorite Child's Play 2 T-shirt. Fright-Rags will celebrate Friday the 13th by re-releasing Jason Edmiston's "G.I. Jason" design on T-shirts and tank tops for three days only beginning Friday at 10am EST. HABIT - On UK DVD and Digital NOW!!!! MAYHEM arrives on UK DVD this month!! !